We approach each and every hiring decision for the “long term.” This is true for all of our associate positions – driver, office, diesel technician and warehouse. When I say for the long term, the reference is through retirement. We want our associates to understand that when we invest in them via a hiring decision our desire is they stay with us until they retire. Obviously this is an aspirational goal. Our job is to make it “come to life.” So, how is this accomplished? We start by identifying four key pillars to our success in the Talent Management area – Attract, Develop, Engage and Retain. If we execute each of these pillars successfully it makes our desire of “Hire to Retire” a possibility. In one sense the pillars are sequential in nature and obviously start with the “Attract” or hiring process; however, once the hiring decision has been made then the pillars tend to work together in a concurrent, ongoing fashion. In Talent Management we have created an icon that depicts our philosophy of Hire to Retire. The centerpiece of the icon states – people are our differentiator. Our associates are what sets us apart in this industry. The more we can get associates and leaders to align around and understand our Hire to Retire objective the more likely it is to flourish. There are many long-tenured associates at Schneider. We have over 200 with 30-plus years of experience at the company. That suggests we are doing things the right way and are building an organization that lasts forever! Want to be our next hire-to-retire success story? Search driver, office, diesel technician and warehouse opportunities near you. Todd Jadin is Vice President of Associate Relations and Talent Management for Schneider and has been an integral member of the Big Orange for over 30 years. When not creating the associate experience, you can find Todd spending time with his family and actively assisting with youth basketball in the Green Bay area. 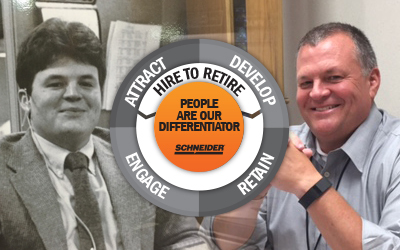 Career and Professional Development: What Opportunities Are Offered at Schneider?